Kids playing with the soccer ball Ryan Jr. donated. Am I holier than you? I heard a wise man once say that he thinks when he gets to heaven and sees who is sitting on honored seats next Jesus’ throne, it won’t be Billy Graham, Mother Theresa or a guy like me. It will be a little Chinese, Indian or Vietnamese grandma, who never learned to read or write, spent her life farming rice and praying anonymously most her life. I’ve also heard of a gentleman who had a dream of going to heaven and being introduced to a hero of heaven. An angel told him, it was a homeless man who was caught in a snow storm with his buddy, and gave his friend his only blanket to keep him alive, sacrificing his own life. What about the young man in the current news, who just sacrificed his life at a chance to share the love of Jesus, with a hostile tribe off the coast of India. He received no praise, was never a big time conference speaker, but followed his passion for Christ to the fullest. What of the dozen men last year who were abducted by ISIS and killed one at a time after they refused to deny Jesus? What of the millions of other Jesus followers who live in “poverty” and will never have indoor plumbing, drive a car or use a computer? Often times, I have to admit, I forget. I think my work is God’s work, when in actual fact I am spinning my wheels, attempting to “make” people better. In actuality, the most potent and powerful ‘tool in my box’ comes in the likeness of my four year baby girl. When she crawls into my lap, kisses my cheek and asks me for just about anything, I’m like putty in her hands. If there is a scary spider, I become pest control, ready to crush all arachnids. If she needs dinner and gives me that big pretty smile, I can easily become the angry chef, and I will break you if you try to keep me from feeding my her. If there’s something she needs from a top shelf, or from the highest tree, I suddenly find myself scaling unwise heights or “MacGyver-ing” a way to get that toy down. For my baby girl, her health and happiness exceeds all worry and sometimes sense. Jesus said, “faith as a child,” that is what makes us great. The belief that I can crawl into the lap of the Creator of the universe and ask for anything in my heart, makes me invincible. This week, I was blown away! 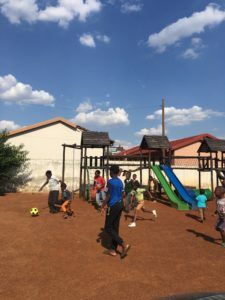 We visited a children’s center (orphanage) in a poor part of a township in South Africa. Both of my children asked what we could take to give the children. Emma had sheets of super hero stickers she gave away to children, and as we left, Ryan Jr. donated his soccer ball to the boys. I would give all the money I have for stickers and soccer balls if my kids are going to continue to share them with kids who get maybe a toy or two a year. It makes me think that when I sit in the loving arms of all powerful Daddy in heaven, and ask him to give to others, how much warmth must fill His huge heart? So, am I better than you, because my job title includes serving others? I don’t think so. In Matthew 25, Jesus praises those who served the poor and in turn served Jesus himself. He went on to say that those who served Jesus replied, “When did we help you?” They didn’t even know! I think they just saw themselves as a four year old, asking their Dad if they can give a super hero sticker to another four year old.